WIX Cabin Air Filters remove pollen, dust, soot and other air borne contaminates from the air inside a vehicle for normal and severe driving conditions. WIX cabin air filters are enhanced with Microban antimicrobial technology which inhibits the growth of microbes on filter media and protects against damaging bacteria, mold, and mildew. Where applicable, combination odor removing media reduces odors from the exhaust systems of nearby vehicles. WIX cabin air filters are recommended for OEM filter change interval. 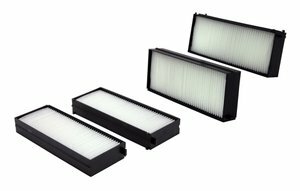 WIX offers a full line of high efficiency cabin air filters for passenger cars and light trucks.